That seems to be the unofficial mantra for many teachers. Here are but a few examples. 1. 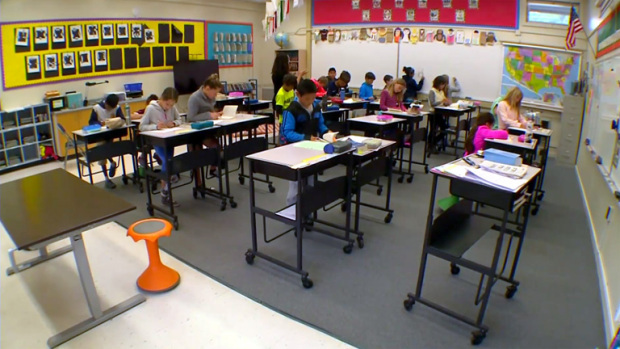 The Chairless Classroom – Apparently educators are so concerned about obesity numbers they have devised a classroom trend that sees chairs make way for tall desks (as pictured above). Not only is it utterly uncomfortable for students to write and stay constantly upright, but such a rule almost always fails to extend to the teachers. I believe that since teachers aren’t always so fit themselves, all chairs should be removed from staff rooms. No chance that will ever happen. 2. Anti-Bullying Lessons – How often do you find that those in charge of formulating anti-bullying policies or teaching the anti-bullying message, are the biggest bullies among the staff? What good is it to preach against gossiping and slander when you are one of the biggest exponents of it going around? 3. “Don’t Talk, and Pay Attention” – Have you ever watched teachers during a PD conference or staff meeting? Not exactly model citizens for attentive, courteous behaviour. 4. “There is No Excuse for Not Doing Your Homework!” – Yet there seems to be an array of excuses why assignments aren’t marked promptly and lessons are often poorly thought out. Hmm …. I know these are all generalisations and do not apply to most teachers, but the point is still very important – your message is meaningless unless you practice what you preach. This entry was posted on April 28, 2015 at 9:33 pm and is filed under Education Matters. You can follow any responses to this entry through the RSS 2.0 feed. You can leave a response, or trackback from your own site.